I was first introduced to this spot by my friend Frances (@franceslove) after a meeting at Atlanta's premiere recording studio, Patchwerk. She led me directly across the street to this non-descript building that I'd always wondered about but was never quite sure what it was. I didn't know if it was a school or an office but I was pretty sure it wasn't a restaurant. Boy, was I wrong. I found myself sitting down in what is essentially the kitchen (pic below) of this spot and drifting off into my own little imaginary episode of the Sopranos. Now, this eating in the kitchen thing was totally new to me. In my many many food outings, I would venture to say that 99.9% of the restaurants I'd eaten at offered some kind of separate dining room experience. You may be able to HEAR the staff in the back cheffin' it up but you rarely SAW them. Not here!!! 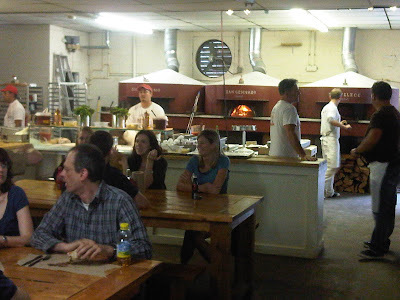 Here, you sit within 30 feet of three (3) 1000+ degree flaming ovens. You're able to witness first hand the half dozen or so cooks on staff flip dough, stir sauce, chop veggies, and stuff your made to order pizza directly into the fire. Once your pie is done, they bring it to your table on a long rectangular baking pan similar to what you would bake cookies on. The first thing you'll notice is that your pizza is PIPING HOT!!! The second thing you'll notice is that this is NOT your run of the mill take out pizza. The cheese is noticeably fresh, the meat toppings are chunkier than normal, and the vegetables stand out like they're on display. The edges of the crust are slightly charred from the furnace it was cooked in but you don't notice it much in the taste. The owner, Giovanni (a super nice guy who you can tell is from the old world), told me that this is what I should expect from an authentic Neapolitan pizza. The taste did take some getting used to. It wasn't because the food was bad in any way. But, when your taste buds have been conditioned for 30 years to think that Dominos is the way pizza should taste, this contrast is kinda shocking. Plus, this wasn't my usual pepperoni and mushroom order. Actually, I think I insulted Giovanni by ordering a standard pepperoni pizza at first. He gave me a sorta menacing scowl that said "order something else". In the end, I was forced encouraged to get one of his "special" concoctions (a variation of the margherita pizza). VERY GOOD!!! There are some downsides to Antico though. First, the prices. The average ticket is about $20 per pie. While I definitely understand paying for quality (and this pizza IS quality), we're in a recession era where the major pizza chains like Papa Johns and Pizza Hut are selling multi-topping pizzas for $10 or less. Those places offer some specials that would allow you to get 2 or 3 specialty pizzas for the same price as ONE from Antico. Second, the parking. This place is usually jam packed due to it's Midtown location and its' proximity to Georgia Tech. Their main lot in front of the restaurant only holds about 6 cars which leaves on-street parking (which can always get tricky downtown). They have added a fenced in lot adjacent to their building but once again, THIS PLACE GETS PACKED!!! Sometimes, even that is not enough to hold the crowd. Overall, I'd still recommend this spot to anyone looking for a quality taste of Italy and a cool change of pace in your dining experience. 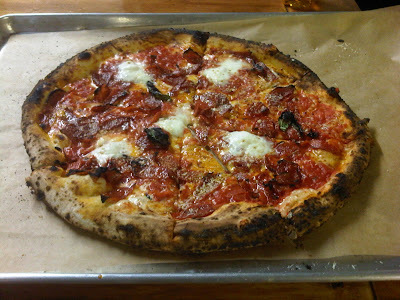 Like Antico Pizza on Facebook. One of my favorite spots in town! Don't forget, this is a BYOB place - you can bring your favorite bottle of wine or 6pack and have quite the experience. 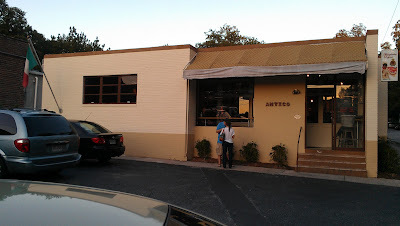 Yes, Antico is dope!!! How did I not know that it was BYOB though?? Maybe it's because I don't drink much wine. Thanks, Tamera! I'm gonna go search for tat Fuoco di Napoli this weekend!!! Seems like you need to come write for ATL Bite Life!!! haha...I can guest write. I'm a self-proclaimed "foodie" myself and like talking to and eating with those who are also. I love small pizzerias that are catered on house specialties. From my pizza adventures, oven basked old country styled ones are the most exquisite. That's nice piece of pizza. However it's burnt I probably would still give it a go coz I'm starving.